A couple of weeks ago a friend recommended to me the book Sons of Cain by Val Bianco. After being told the general storyline, I was interested in reading it and was able to do so. I was delighted as I very quickly became wrapped-up in a page-turning book that left my emotions flying and waiting on the edge of my seat to find out what happened next. Sons of Cain revolves around Nick Rieper, an honorably discharged member of the Navy-SEALS and wealthy owner of a large security company. A practicing Catholic, Rieper has a strong sense of faith, piety, honor and desire to serve Jesus Christ. He decided to use his considerable talents and financial resources to form an elite squad of other like-minded men into a quasi-monastic community called The Knights of Longinus. Rieper and his Knights travel the world exposing the dark underworld of international Satanism. The primary enemy (after Satan) is “Namon,” a demon who has been roaming the world for millennia inhabiting different bodies. Namon has his own organization called the “Cainites” who have been working to undermine world governments. Their latest target: the United States, specifically the Supreme Court. Rieper and his Knights work to thwart Namon and his various henchmen from succeeding in their plan. The valiant acts, selflessness and courage of the Knights against a power superior to humanity by nature may serve as an attraction for many male readers. Some women may not appreciate this aspect of the book, though they may appreciate reading the chivalrous attitude and behavior of the Knights. Women may also find a connection with the primary female character, Robyn Alexander, as she grows and develops throughout the story around such passionate men. Bianco weaves a story that incorporates a lot of Catholic teaching and pious beliefs with conspiracy theories (and some not so conspiratorial) and “ripped from the headlines” politics to create a thrill for his audience. At times, the story seems fantastical and perhaps a little forced, but underlying this are just enough facts to give credence to the story and make one think about the world around us — especially to think about how spiritual powers, good and evil, are working in this world. These facts allow Bianco to critique the contemporary world and its denizens from a Catholic perspective especially on the topic of social justice. In light of the strengths of Sons of Cain, there are some issues present that are important in considering what age-audience is appropriate for the book. Nothing of what follows is to be considered as questioning Bianco’s fidelity as it is apparent he made many efforts to be faithful to Magisterial teaching. First let me begin with some minor points. A distinction must be made over the focus of the book. Sons of Cain is not intended to be a theological work, although its subject matter could certainly be used to open the door for catechesis of young adults. However, since the book touches upon some sensitive matters of faith and good morals, it would have been preferable to have the imprimatur and nihil obstat, which are not present. A fine theological point concerns the nature of humans and demons. In a scene where the priest in the story, Fr. Picora, is entering into a dangerous situation with demons, Bianco writes, “The demons of Hell are of two types: the rebel angels and the condemned souls of the human damned” (244). Once in hell, human beings do not become demons. They remain humans, albeit damned for all eternity, but they never change their nature from human to angelic (even if fallen). On a final note, a strong sense of what I will call “Catholic Vigilantism” can be found in Sons of Cain. This Vigilantism pervades the entire book and is based upon considering the following question: who intentionally sets out to found a group of elite men that travels around the world to expose international Satanism? I recognize that within the context of the story, this is nothing more than a plot device, but it could be problematic if taken too seriously, especially by a younger audience. I don’t want to give the impression however, that within the story the characters give any less than heartfelt acknowledgemnt of their dependence upon God, need for prayer and the Sacraments, and the urgency of personal conversion and active pursuit of the virtues. In conclusion, Sons of Cain is a very thrilling book despite any drawbacks on the theological or literary level. Because of its advanced themes, the book is best suited to Catholic young adults and above. 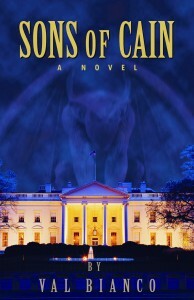 For anyone interested in reading a religious thriller set in contemporary times, Sons of Cain may be just the book for you.